Woods's gold-played kicks were in honor of Vegas's hockey team the Golden Knights. Tiger Woods and Phil Mickelson wore rather predictable outfits in their match Friday, Woods donning the red and black and Phil Mickelson in black from head to toe. One surprise, though, was on Woods’s feet. 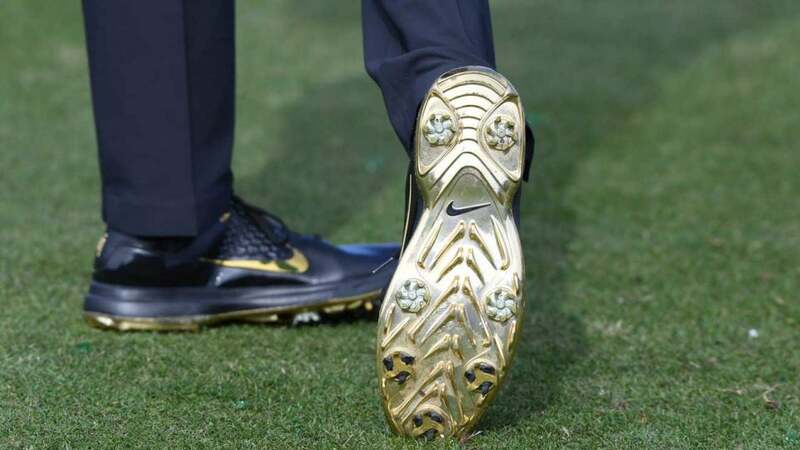 Woods wore his usual Nike TW golf shoes, but with a shot of gold injected into them. The Nike swoosh on his kicks is gold, as are the spikes. On-course reporter Shane Bacon ask the question everyone was wondering: What’s with the shoes, Tiger? Well, Tiger liked the idea of honoring the Golden Knights, Vegas’s NHL team. Simple as that, huh? They’re definitely slick shoes. Woods has been wearing Nike shoes for decades now. You can see all the variations — some of them good, others not so good — by clicking here. Early indications say these ones are fan favorites. Those Nike shoes worn by Tiger are awesome!